There are some times when I wonder if I will ever feel “grown-up”. 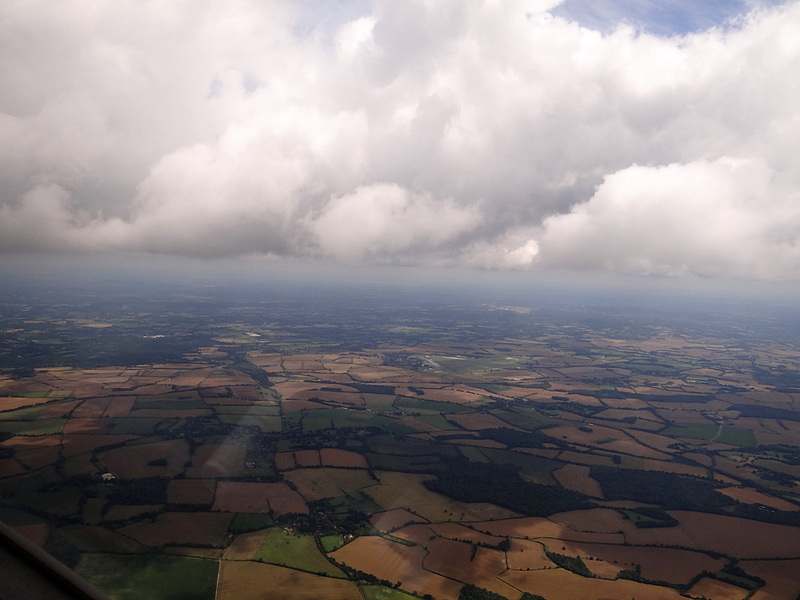 The flying on this Friday provoked such a reaction, for during the 92 minute flight I was to come close enough to a buzzard or two that it left me speechless – which I made up for with childish glee during the rest of the afternoon by telling every other club member I met about it! Luckily I was able to get a few photos of our feathered friends. The background to the day was as follows: During the week there had been two great flying days which I could not attend due to work commitments, and I knew that the weekend weather was not looking good. 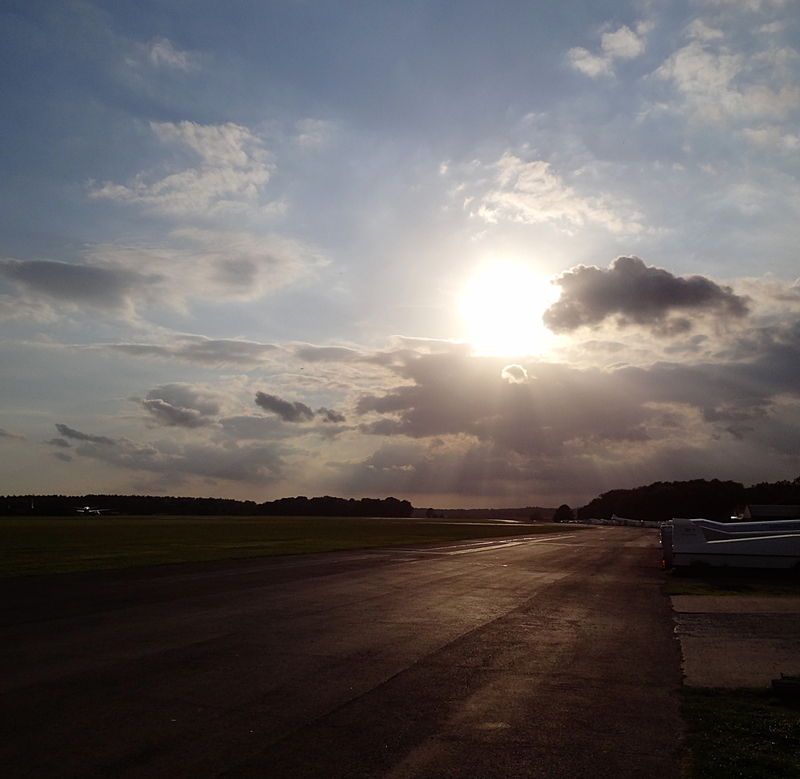 I turned up on Thursday evening hoping to at least hangar fly one of the gliders, but alas, I was too late and they were too busy to fit me in. 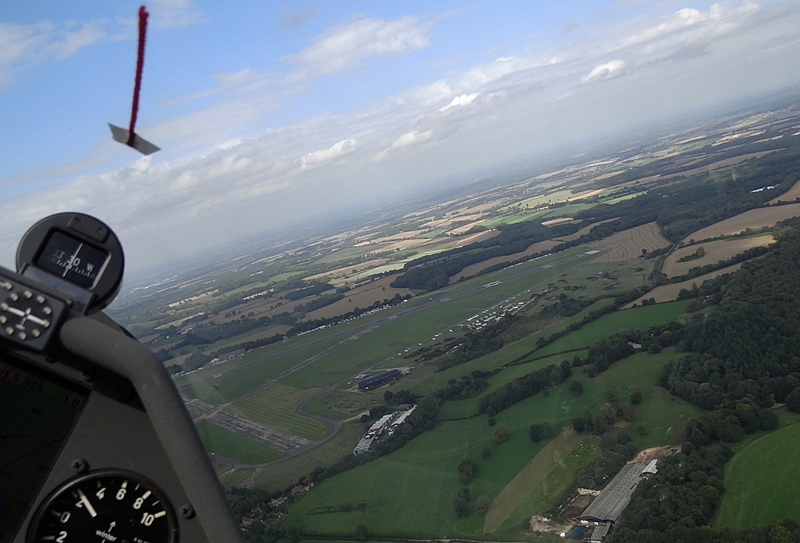 On returning home I reasoned that since I had finished some work on Thursday ready for the weekend, I could afford to take the Friday off for flying, although it was only expected to be a marginally good day. Well – it made sense to me. 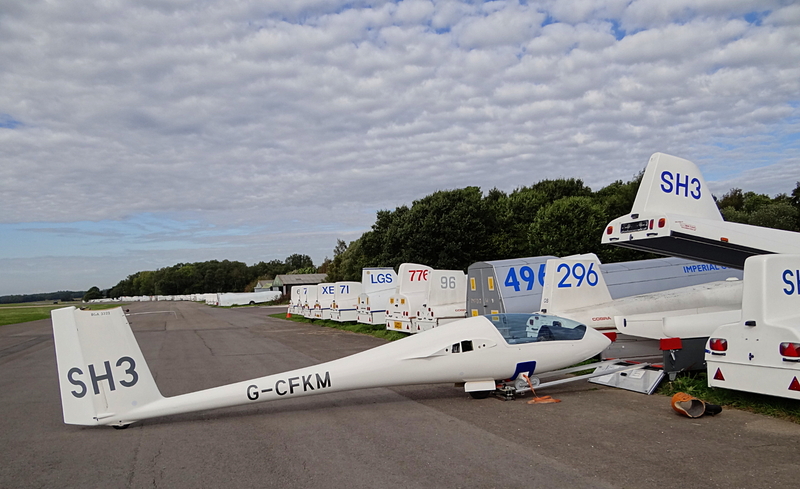 So I set the alarm for an early rise in order to be there for the ballot of the single seater gliders at 8am. The morning arrived with the bleeping of the alarm. Is it just me or are early morning decision processes tricky? I thought that as you got older it should be easier to get up early! Outside it was overcast and I almost decided to give up flying and go to work anyway, thus saving my holiday for later in the year. 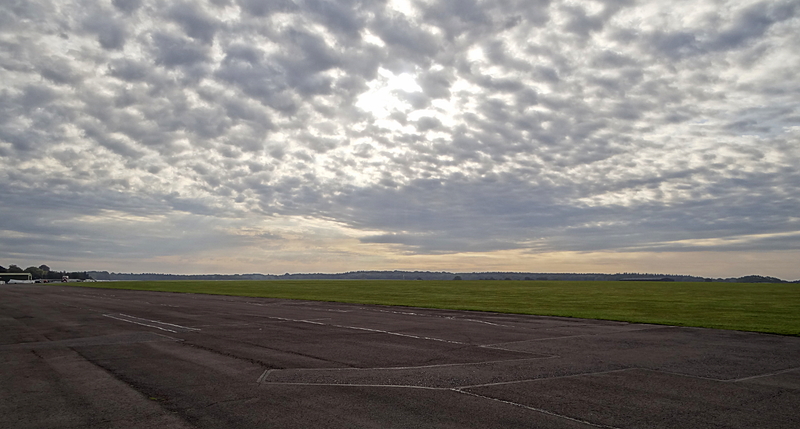 However in the end I did go to Lasham, though I could not get myself up early enough for the 8am ballot. Lazy, lazy, lazy. I know. But as it turned out it was not to be a problem. Early morning skies showing the extensive top cover. So up and prepped; NOTAMs checked; weather checked; and it was off to the club. Only one other person was there to grab a single seater so my early morning “lazy” decision was vindicated. After a “proper” breakfast and the morning briefing it was out to the hangar. 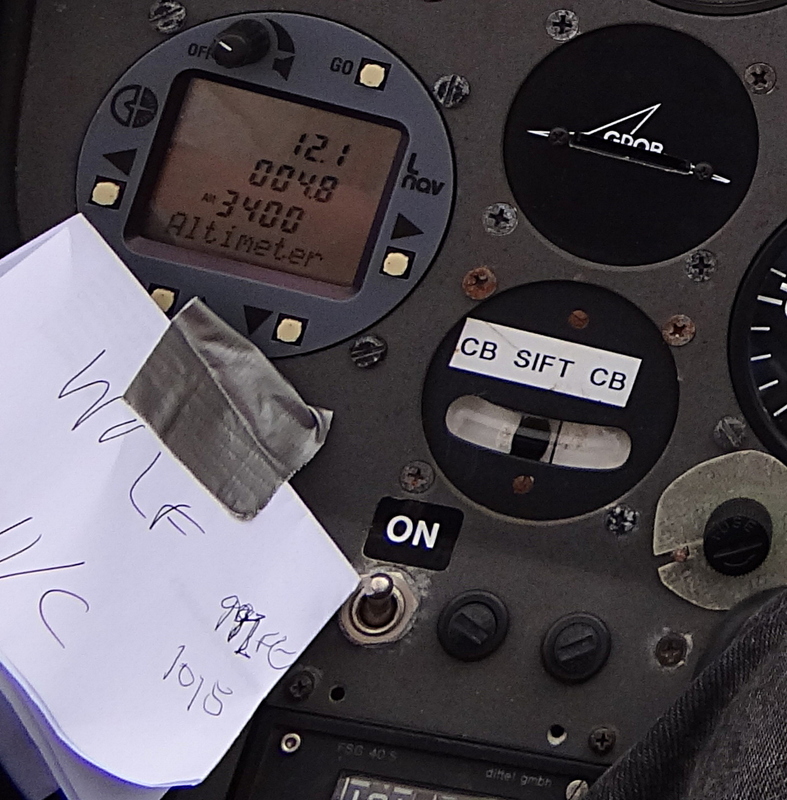 A NOTAM is a “NOTice to AirMen” and is essential reading for any pilot planning a flight. It is administered by NATS and is part of their Aeronautical Information Service, or AIS. Don’t you just love those long sentences? But they are important long sentences and many a pilot has to get used to such language to get through the inevitable paperwork and exams related to flying. The above items might, for instance, cover operations such as The Red Arrows, or any other flying display; Parachuting; Balloon flying; or even filming where the film crew don’t want little aircraft buzzing around ruining their period costume drama! It does happen. 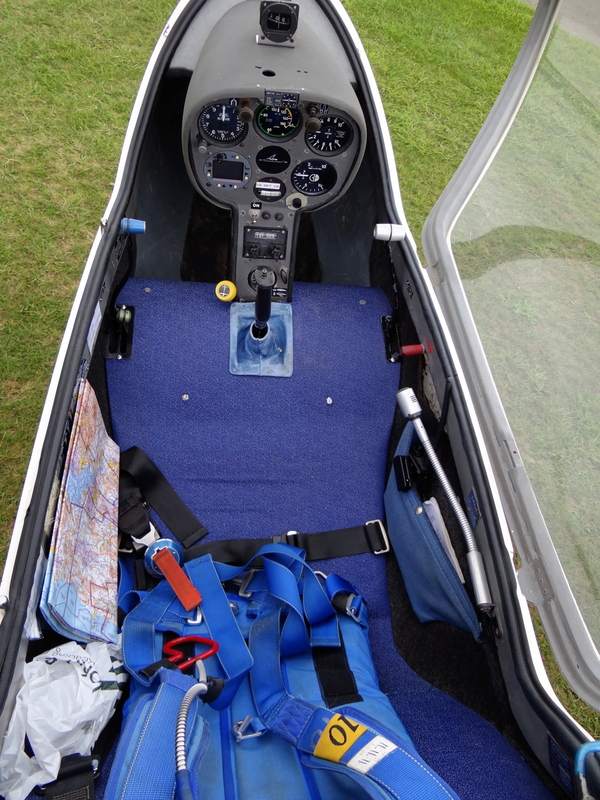 When deciding which single seater to fly, I had made another “lazy” decision to take SH7, the baby Grob, since I knew it would be rigged. As it turned out it was buried at the back of the hangar so I decided to rig one of the “Modern Beauties“, Discus SH3 as I expected this would be less of a chore to get ready for flying. 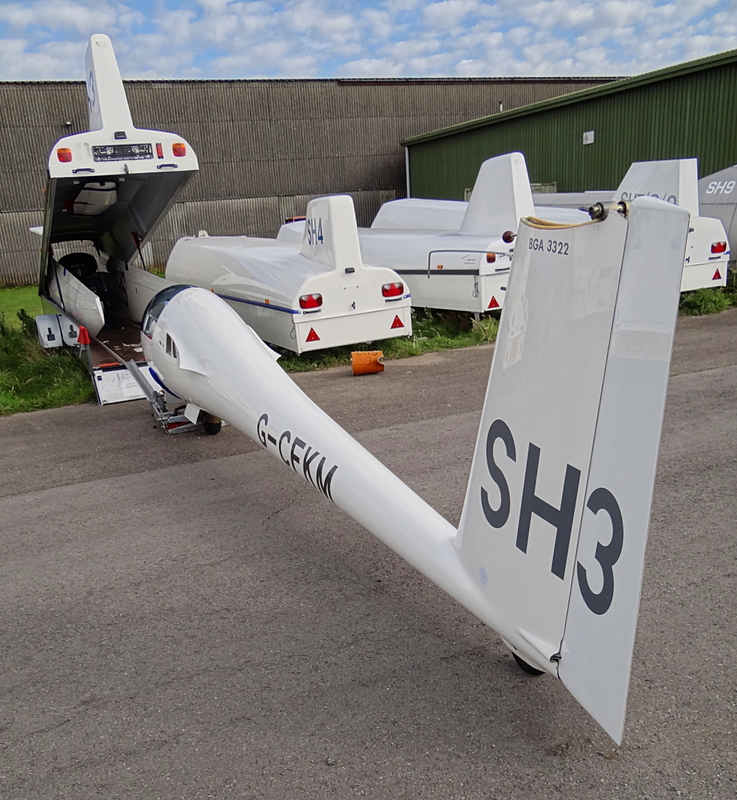 There were 6 other gliders in front of SH7 in the hangar and a definite dearth of helpers. The conditions were not looking good as a lot of high cloud was present from the night before. It was going to be a case of waiting for it to disperse, which thankfully it duly began to do during the morning as you can see from the early photos. The early reports from the initial K13 training flights were that no lift was around, so I decided to take an exploratory winch launch to see what the conditions were like. I expected this to be a short flight that would also get me “rolling” for the day. The plan was then to take an aerotow. Ahh. Plans, plans, plans – they rarely survive contact with reality. By the time I had the Discus rigged, cleaned, over to the launch point, and sorted myself out – it was 12:15 and the conditions were just starting to get going. There was a medium strength southerly crosswind and we were launching on runway 09 towards the east. I queued up, got strapped in and waited for a cable. The winch launch was unremarkable, though only a 1300ft launch height – I am still not getting good launch heights with the single seaters. 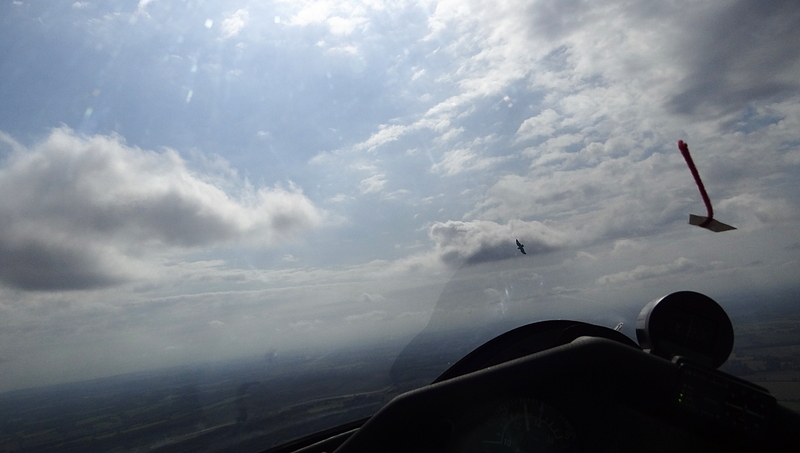 However it was enough for some minutes of bimbling around and I decided to go upwind to the south of the airfield. This was to cause a few problems later but did result in finding some lift. I flew around and did not manage to pick anything up until eventually I saw another glider coming in below me to join the circuit from the south-east and I decided to follow it in. 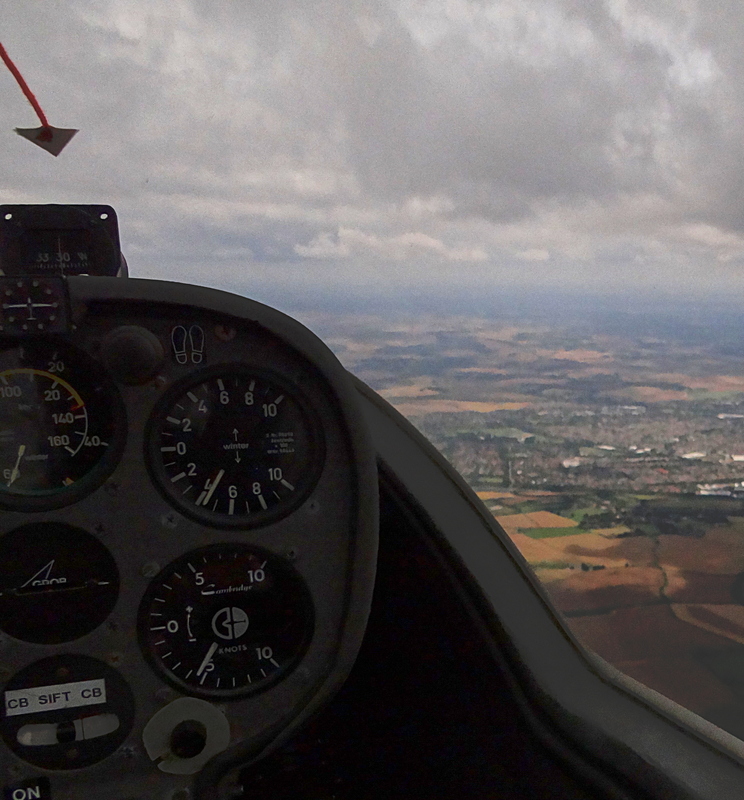 I was pretty high as I began my circuit, and as part of the pre-landing checks put the undercarriage down. 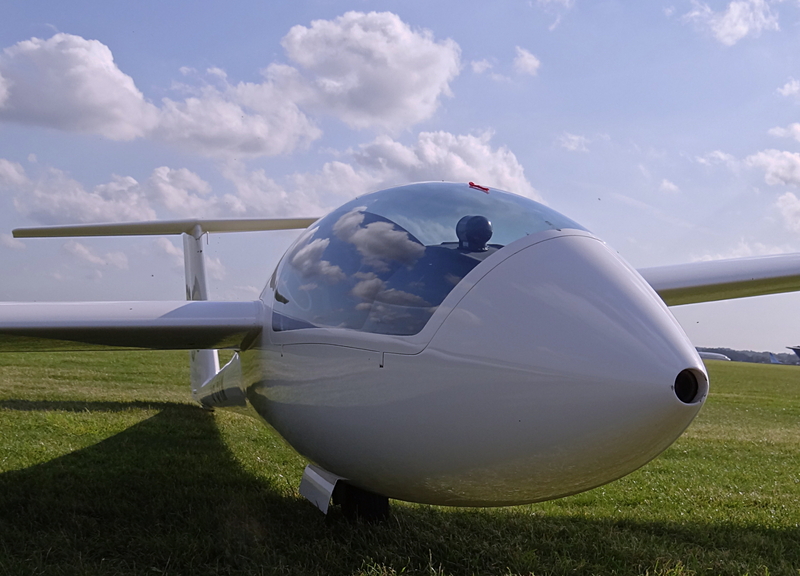 All was going fine and I was expecting, as planned, to take an aerotow next. But then at around 700ft on the downwind leg I got the most amazing kick up the pants as I hit a 4up thermal. I am afraid I could not resist it since (a) I knew I had enough height and (b) knew there was no-one else in the circuit. After just one turn I knew I had a good one and put the undercarriage back in its box. 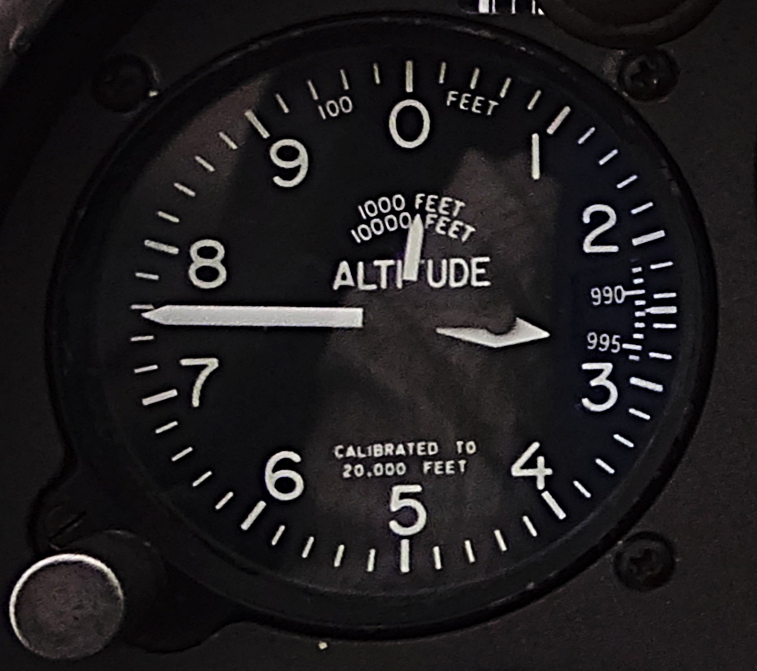 So all was going well and I climbed up to 1000ft but the next problem as alluded to earlier was that I was now drifting close to the launch area. 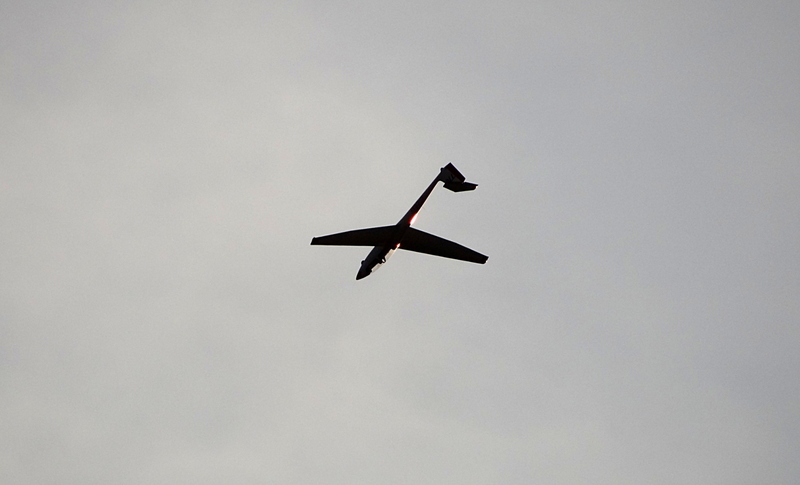 I could also see that they were getting ready to launch a glider so I had to leave my beloved 4up thermal and go further south, upwind and away from the launch area. 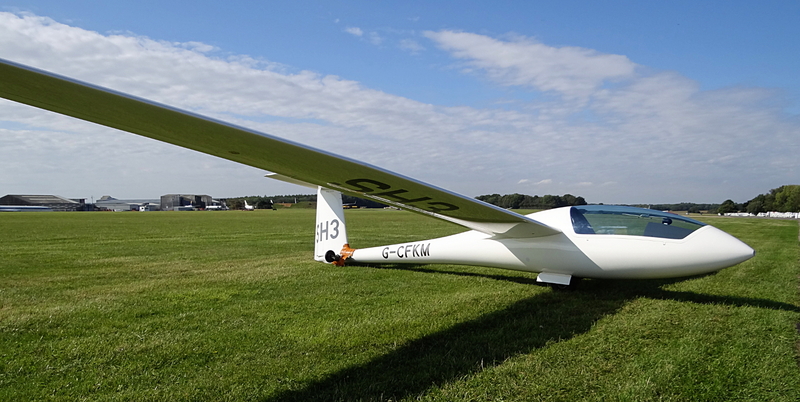 The waiting glider below was now being launched, but I had lost the “biggie” and was only getting weak 2up thermals, though enough to keep me at my height. At last another good thermal came along and I took it, beginning the inevitable drift back over the launch point as I circled. This time, however, I could see that they were not ready to launch so I called up and asked if I could overfly the launch point. 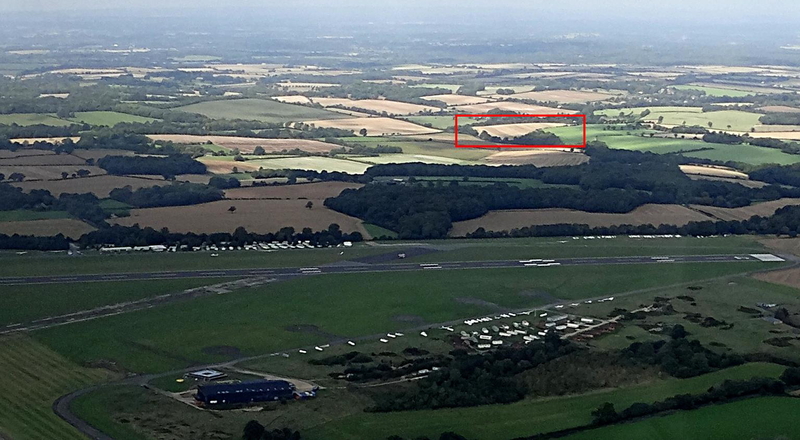 Luckily this was allowed and I happily continued thermalling from the south of the airfield to the north without disturbing their operations, gradually climbing from 900ft up to 1500ft. 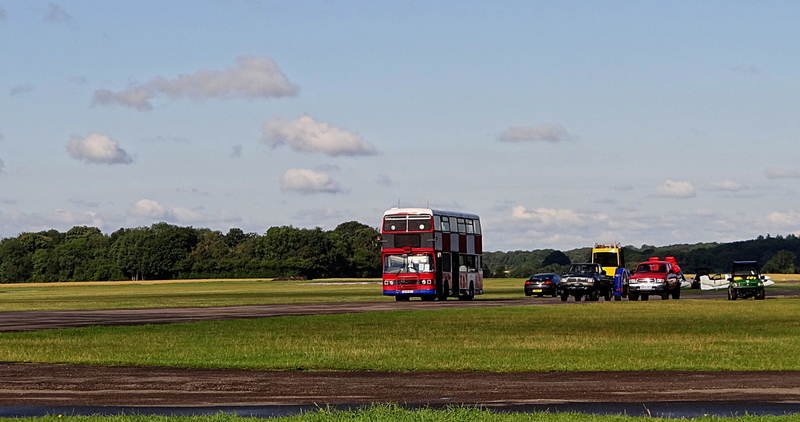 Being on the north of the airfield allowed me to check a bit of theory about thermal formation. I had heard that one should look for places where you would get differential heating. I reckoned I could see one where there was a wood on the south side of a brown stubble field. I was hoping that the air just on the north of the wood would be sheltered from the wind, allowing a big enough bubble of warm air to form which would later get detached due to the windy conditions. Enlargement from previous photo of the view north. The red rectangle shows the wood and field described in the text where I found a thermal. I was absolutely open-mouthed when I found this actually worked! It was not the best thermal of the day, but the theory did seem to work. Fantastic! With this thermal I managed to get to about 1800ft, at which height the lift seemed to “top out”. This was to be a consistent feature of the day’s lift. It was shortly after this that I had my first encounter with a pair of buzzards. Words fail to put over the feeling when encountering these wonderful fliers. I am not so deluded to think that I am anywhere near as good as they, nor can I claim a close kinship – the best I can say is that I felt linked to them in some small way. Yes – the word is “Participated”. I participated in their world and felt awe at the effortless connection they have with the aerial habitat. I also felt very lucky that I was able to fly with them for the small time I did. Of course due to my higher speed, I could only fly around the outside of their circles, and as you would expect it was almost a guarantee that wherever they were – there was rising air. I was gratified to see that they were not at all bothered by my presence, being quite happy to pass within 50 metres of the glider, although I was careful to make sure I kept far enough away so that neither they nor myself would be disturbed. By now I was back on the south side of the airfield where the air was moving in decidedly strange ways, definitely not in nice circular thermic bubbles. I decided to try and sort of “wind-surf” by flying to and fro rather than staying in circles. This seemed to work for a while but “needs more research”. It was at this time that I came upon another buzzard and managed to get some photos which I hope you agree are pretty amazing. Apologies for the angles since they were definitely “action” shots with one hand flying the aircraft and one hand on the camera. 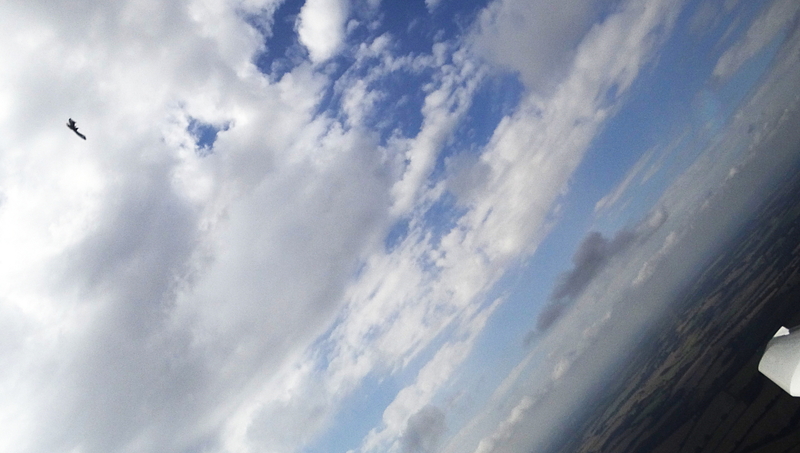 The time was now around 2pm and I was getting quite tired as it was proving to be a tussle to stay airborne. 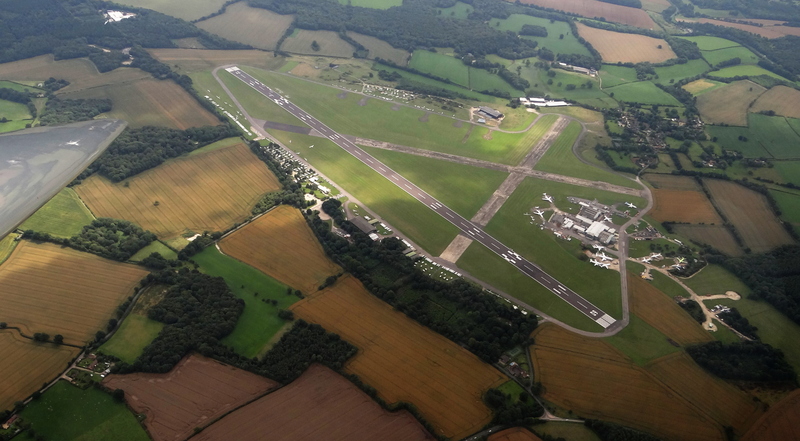 I flew around to the west of the airfield as I could see ground movement of the launch point as the operation moved onto runway 23. This coincided with hitting some really strong sinking air going down at 600ft per minute just as I was on the downwind leg of the circuit. I almost thought I would have to turn in early and land crosswind but luckily came out of the sink and found some lift and carried on to return to a normal landing. I opened the canopy and just stayed in the glider resting and contemplating my experience while I waited for the retrieve buggy. 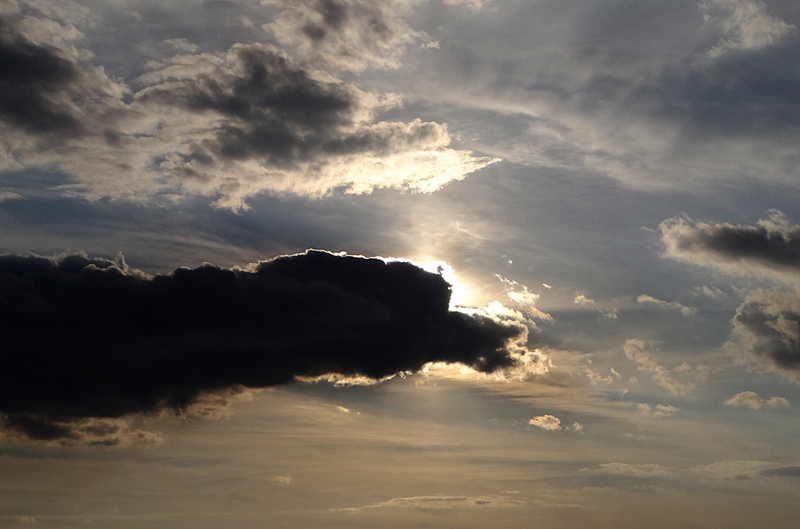 I had just completed a 92 minute flight, I believe one of the longest of the day, and had managed to fly with the birds. Definitely one of those “self-actualising” experiences as Maslow would say. A day for the birds. 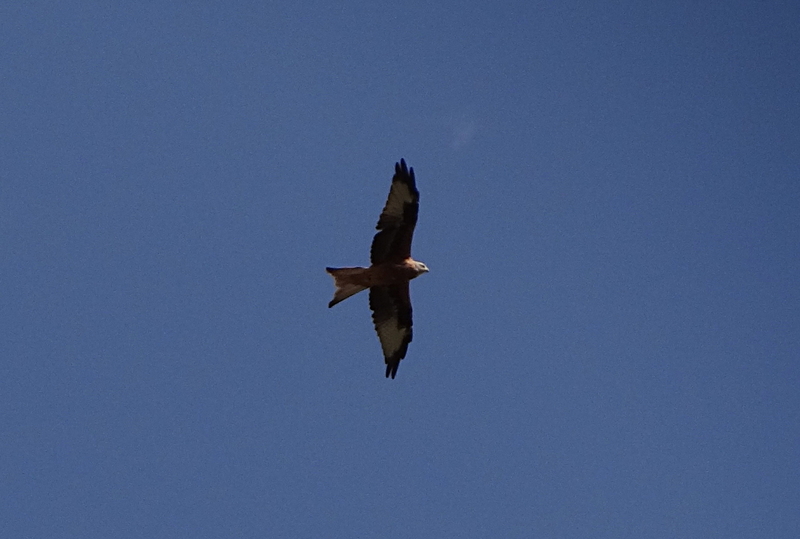 Photo of a red kite taken later from the ground near the threshold of runway 23. Bird of a different kind, but still beautiful. SH3 waiting to be put back in the trailer. And so it was time to go home and Reflect upon the day’s experiences. I hope you enjoyed my Rambling here and that I did not Rumble too much!